Hailed as, "One of New York's most exciting musicians..." A.J. Merlino’s intense and versatile performing style has made him a highly sought after percussionist. His playing has taken him around the world including Scotland, Croatia, Greece, Thailand, Australia, and Argentina. While residing in Las Vegas, he performed on the Las Vegas strip with such artists as Jay-Z, Redfoo of LMFAO, Ronnie Vannucci of The Killers, Eric Marienthal, and Cee Lo Green for the 2012 Billboard Music Awards. He has also collaborated with famed percussionists Michito Sanchez, Pepe Jimenez, Christian Tamburr, Bernie Dresel, and Kurt Rasmussen. A.J. Merlino currently serves as the percussionist for We Used to Cut the Grass, Remember Jones & the Emancipation Congregation, Bella Vita, Colton Kayser Band, and performs as a soloist for an electronic percussion show entitled Percussion avec l'électronique. He can be heard of various recordings including: Woodpecker – Percussionist for We Used to Cut the Grass, Stranger Heads Prevail – Percussionist for Thank You Scientist, Lost Vegas - Soloist and Principal Percussionist for UNLV Wind Orchestra CD, 2012, Welcome to Las Vegas - Ragtime Rebels Marimba Band CD, 2011, Rebels in Paris - Soloist and Section Percussionist for Vox Ama Deus Ensemble CD, 2011, Colt Kayser EP - Percussionist for Colt Kayser Band CD, 2010. Merlino has worked as music director, composer and performer for many projects held at The Venetian, Mandalay Bay, MGM Grand, and Cosmopolitan in Las Vegas, as well as the production show Resurrecting Sin City, which premiered in Las Vegas and traveled to Adelaide, Australia. As a clinician, he has presented to numerous colleges, high schools, festivals and has worked for the International House of Blues with Kurt Rasmussen. One of the few cimbalom soloists in the country, Merlino has performed as a soloist on this instrument with various college and professional ensembles such as Moravian Wind Symphony, Reading Symphony Orchestra, Vox Ama Deus Ensemble, and premiered the off-brodway production of The Vagabonds. 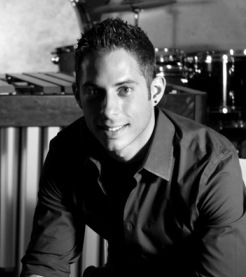 A strong supporter of new music, Merlino uses his diverse skills on dozens of percussion instruments to commission new works from up and coming composers, such as a work for six-mallet marimba and choir by Los Angeles composer Justin Raines and new works for marimba by Casey Cangelosi and Pius Cheung. His work with new music also extends to numerous premieres utilizing various instrumentations by David T. Little, Virko Bailey, Jim Barnes, Scott Steele, Eric Whitacre, and Michael Daugherty. Merlino holds percussion performance degrees from Kutztown University and the University of Nevada Las Vegas where he earned his Doctor of Musical Arts degree. A.J. Merlino is currently teaching for Albright College, Kutztown University, Reading Samba School, New York Youth Musicians, Reading Musical Foundation, Menchey Music, and Crestwood High School.